Has your chimney brush head seen better days? Are you looking for a new brush head to make maintaining your fireplace easy? Have your brush working like new with the Nylon Brush Head Replacement. The nylon bristles are designed to perfectly sweep up ash and soot quickly, making cleaning and maintenance easy. For a price this low, you can't afford to NOT upgrade your brush head. 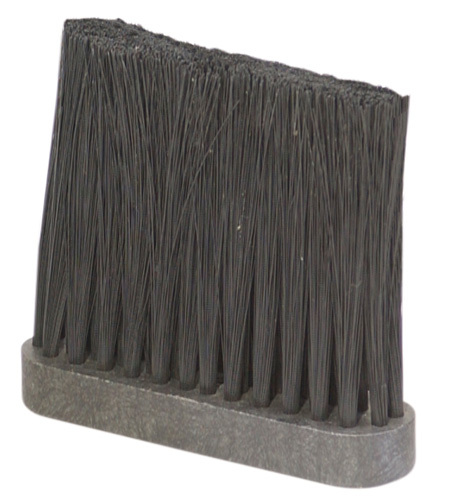 Have your fireplace brush working like new again with the Nylon Brush Head Replacement. How does this head attach? Is it threaded or just have a hole through it? If it is just a hole, what size? It is 5" wide by what width? This has a quarter inch (1/4") threaded hole. Its exact dimensions are 4 1/2” tall, 1 1/4” wide and 4 7/8” long. These measurements include the bristles. What are the actual dimensions of this head? This brush features dimensions of 4 1/2” tall, 1 1/4” wide and 4 7/8” long. This brush has 1/4" thread holes, as well. Easy to replace and fits perfectly. Nice to have a fireplace brush that is functional again. Brushes are fine. Didn't like they shipped the two brushes in separate boxes. Each box could of held 6 brushes, the boxes were so large. Thanks for the speedy shipment. Excellent quality and very speedy delivery. Our 27 year old brush has now been retired!